Slimmer and lighter than before silver Apple iPad Air MD788LL/B comes with great new features like the A7 chip, iOS 7 operating system, better wireless and some of the apps you will see on Apple computers to improve your creativity and productivity and creativity allowing you to feel more in control and to achieve more. It has an aluminium unibody design so it is very solid and durable while being unbelievably thin and weighing just one pound and is able to offer you up to 10 hours of battery life. iPad Air is much easier to use than you may think but you can also connect a wireless Bluetooth keyboard if you wish to type better and faster like you’re on your Macbook. Apple iPad Air is offered with the world’s most advanced mobile processor iOS 7 that is specifically created for iPad Air with an all new design and features, smoother multitasking the 64-bit desktop-class architecture A7 chip to run more robust apps faster- twice the CPU speed and graphics performance of the previous iPad chip A6X, M7 coprocessor that measures the iPad Air motion by getting data from gyroscope, compass and accelerometer and freeing up the load on A7 chip (as iPad Air designed for those on the move) for better performance and power efficiency, 16 GB flash storage and iCloud to help sync your content across your different devices which means you can start working on a spreadsheet on your iMac and complete the task on your iPad later on and as Cloud storage for any of your important documents, photos or contacts or help restore iPad Air to a previous state. 9.7 inch diagonal LED-backlit capacitive touch Retina display with 2048x1536 resolution and IPS technology for well over 3.1 million pixels or 264 pixels per inch (it can show more than 3.1 million colours at once) and larger viewing angles, offers super sharp images and texts supporting multiple iOS touch gestures. iPad Air supports OpenGL ES 3.0 that was once available for only game consoles and desktop computers and it offers better and more detailed visuals and graphics. You now have the iTunes Radio- Apple’s music streaming that is available in US only so that you can listen to the songs you want or download them from iTunes. It comes with two very high quality cameras: FaceTime HD with 1.2MP photos and 720p HD video for FaceTime video calling and the 5MP iSight camera for still images or tap to focus video and built-in digital microphone as well as the high resolution Retina display as a wonderful viewfinder. 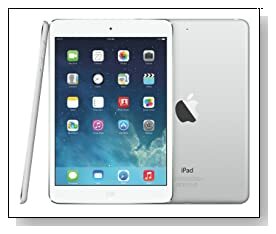 Silver Apple iPad Air has a beautiful slim design with about a quarter less volume than the previous iPad- it weighs only 1 pound (1.05 lbs with cellular) and measures 0.29 x 6.60 x 9.40 inches (only 0.29 inch =7.5mm thick) - 24% less volume, 20% slimmer and 28% lighter than before and comes with an oleophobic coating that is resistant to fingerprints and still is very solid and durable with the aluminium unibody construction. Despite the super compact size and powe,r the 32.4-watt-hour rechargeable lithium-polymer battery gives you up to 10 hours of battery life (great for those out and about a lot), that is partly because of the energy efficiency of the powerful A7 chip with much better wireless performance with dual antennas with MIMO technology- 802.11a/b/g/n WiFi that is dual band 2.4 and 5GHz and that can reach up to speeds of 300 Mbps. You also have the Bluetooth 4.0, 3.5-mm stereo headphone minijack and you can charge via power adapter or USB to computer system. Conclusion: Minimalist and premium design, slim and lightweight Apple iPad Air MD788LL/B with iOS 7, A7 chip, M7 motion coprocessor, 16GB flash storage, Retina multi-touch display, two amazing cameras, faster wireless and Bluetooth is faster, more efficient and powerful than before. It includes features like the Control Centre that is accessed by swiping through the bottom of the screen and free apps that you’re familiar with from Apple computers, like Pages, Numbers, iMovie, iPhoto, Keynote and GarageBand- apps that feel nothing like phone apps but more like apps designed specifically for iPad then you have iTunes, AirPlay to stream movies from iTunes or AirPlay Mirroring, AirPrint to print from AirPrint enabled printer with no cables or drivers to download and AirDrop to share content easily. You can even easily run Microsoft Word, Excel or Powerpoint on it as long as you have an Office 365 subscription. You can check your emails, surf the internet or edit your photos comfortably. In the box you’ll find the Apple iPad Air 16GB with Wi-Fi, USB Power Adapter, Lightning to USB Cable and 12 month limited warranty by Apple.